Keep your beer cold and your fingers warm this season by crafting felt "koozies" decorated with holiday shapes. These adorably fuzzy drink holders would make great gifts for friends, or add a personal touch to your next party. Just follow our easy DIY tutorial to create your own. For a standard-sized beer or soda can, you will need to sketch out two pattern pieces using your pen, paper, and ruler. You’ll need a rectangle measuring 9 inches long by 4 3/4 inches high. You’ll also need a circle (for the bottom of the koozie) with a diameter of 2 7/8 inches. You can create a template for the circle by tracing a can and then measuring and adjusting as needed. 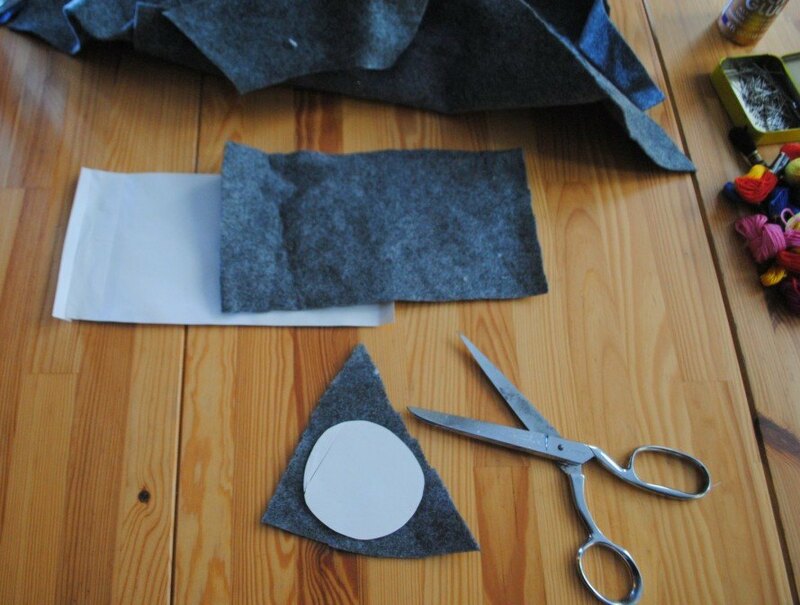 Using the two pattern pieces you’ve just created, trace them onto the felt color of your choice and cut the piece out. For each koozie, you’ll need one rectangle and one circle. 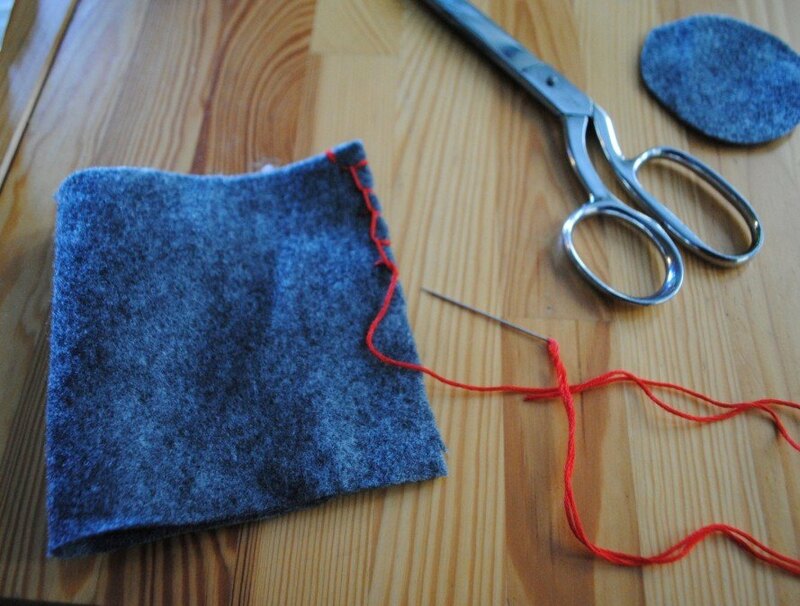 To sew the koozie, fold the rectangle in half and thread your needle with a contrasting color of embroidery floss. Using a blanket stitch or a simple whip stitch, sew the rectangle together with the seam facing out. Next, you’ll sew on the circle to create a bottom for your coozie. Pin the circle around the edge of the bottom of the tube you just created by sewing the rectangle together. Using the same stitch, stitch the circle on. 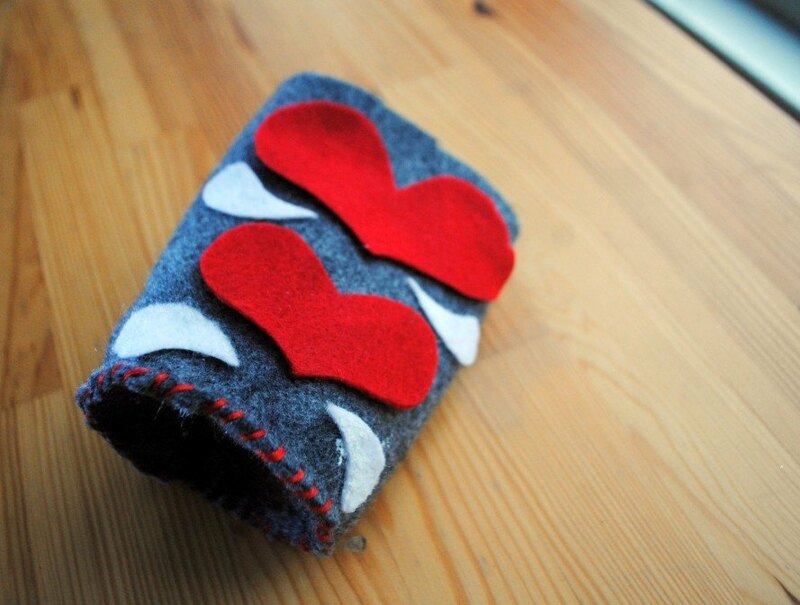 To decorate your koozie, you’ll need to trace and cut out felt shape in contrasting colors. To create this cute folk art heart decoration, you’ll need to cut out two hearts – one slightly smaller than the other – and four teardrop shapes. Next, dab craft glue on the back of each shape and press it into place on the koozie. Let dry. This fun decoration takes advantage of white space to create the illusion of a striped candy cane. 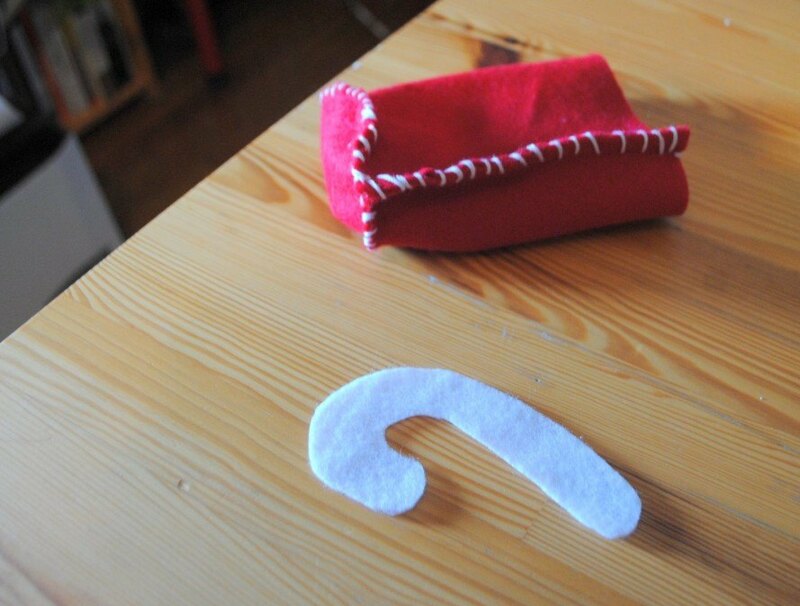 First, trace and cut out a candy cane shape in white felt. 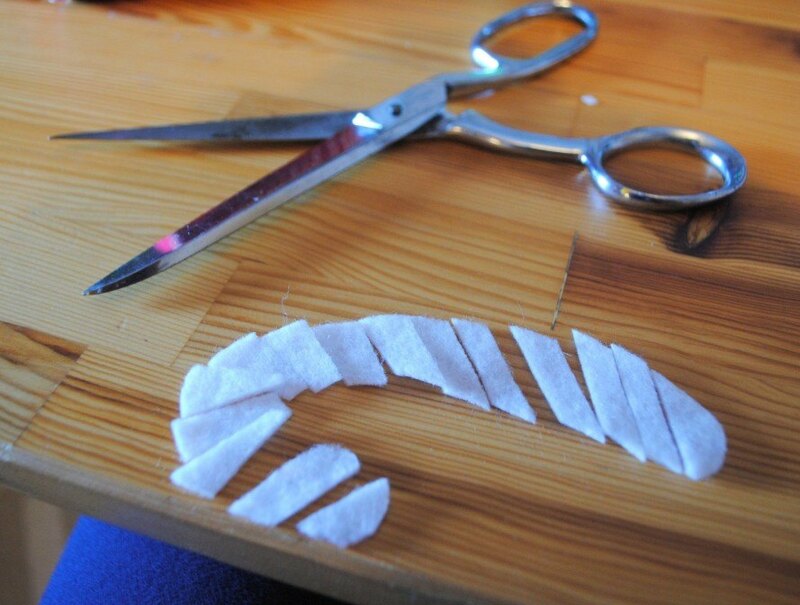 Next, snip the candy cane cutout into strips. Finally, dab glue on the back of each stripe and stick them onto the finished felt koozie. Enjoy your new creations. Cheers! 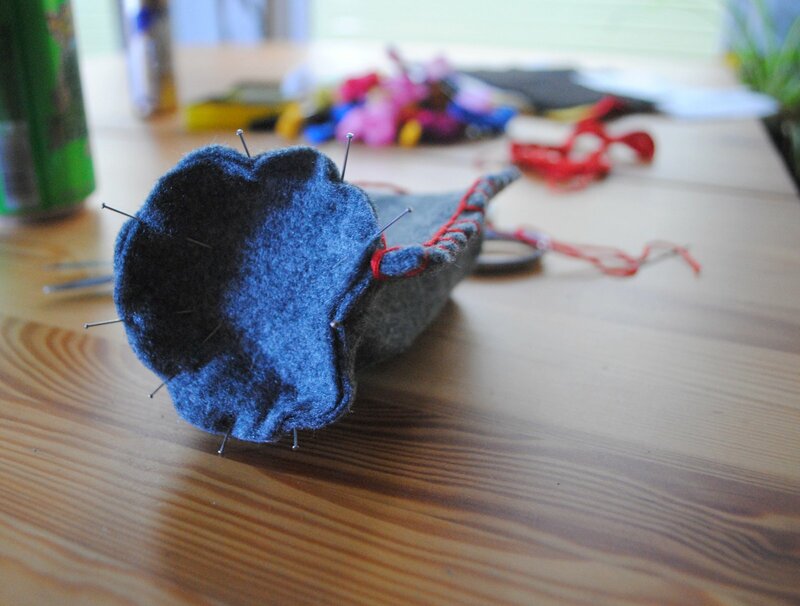 Read on for a simple DIY tutorial for making felt drink "koozies." 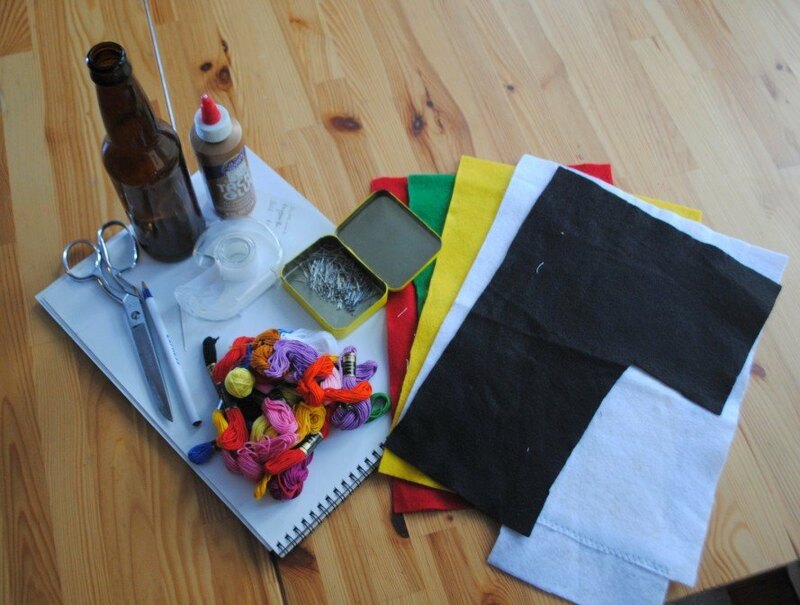 What you'll need: Squares of felt in different colors Craft glue Embroidery floss and needle Scissors Pins Paper, pen, and ruler A beer bottle or soda can for size! For a standard-sized beer or soda can, you will need to sketch out two pattern pieces using your pen, paper, and ruler. You'll need a rectangle measuring 9 inches long by 4 3/4 inches high. You'll also need a circle (for the bottom of the koozie) with a diameter of 2 7/8 inches. You can create a template for the circle by tracing a can and then measuring and adjusting as needed. 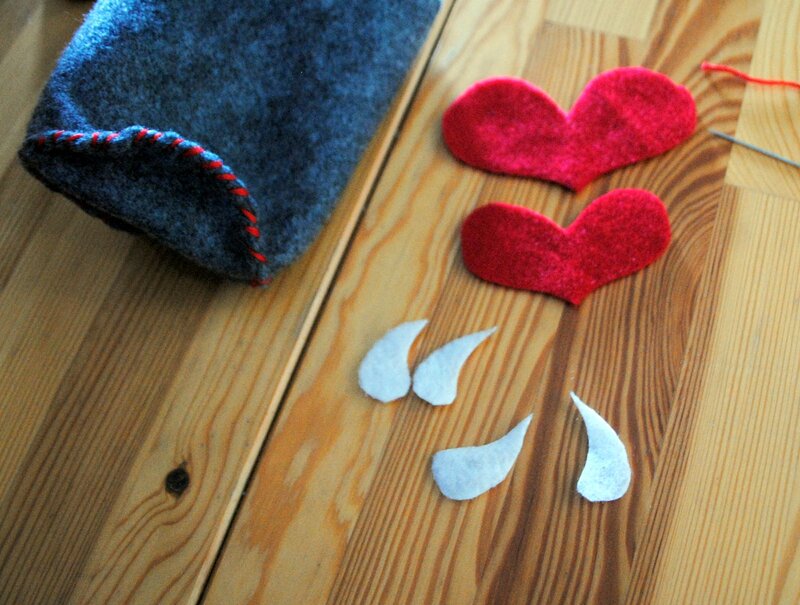 Using the two pattern pieces you've just created, trace them onto the felt color of your choice and cut the piece out. For each koozie, you'll need on rectangle and one circle. 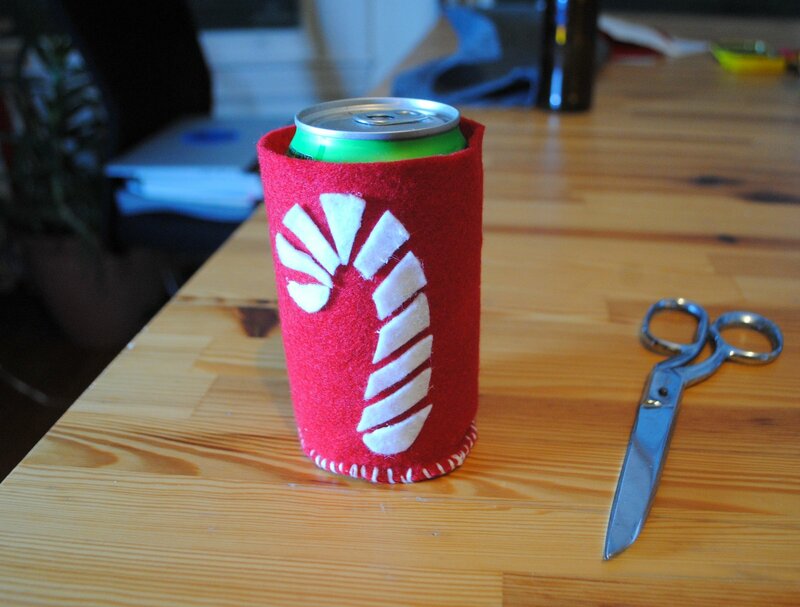 Next, you'll sew on the circle to create a bottom for your coozie. 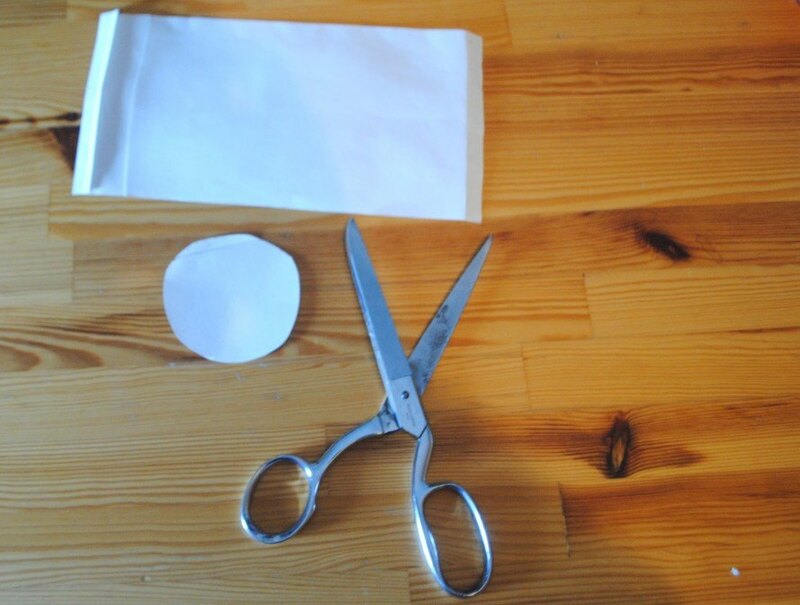 Pin the circle around the edge of the bottom of the tube you just created by sewing the rectangle together. Using the same stitch, stitch the circle on. 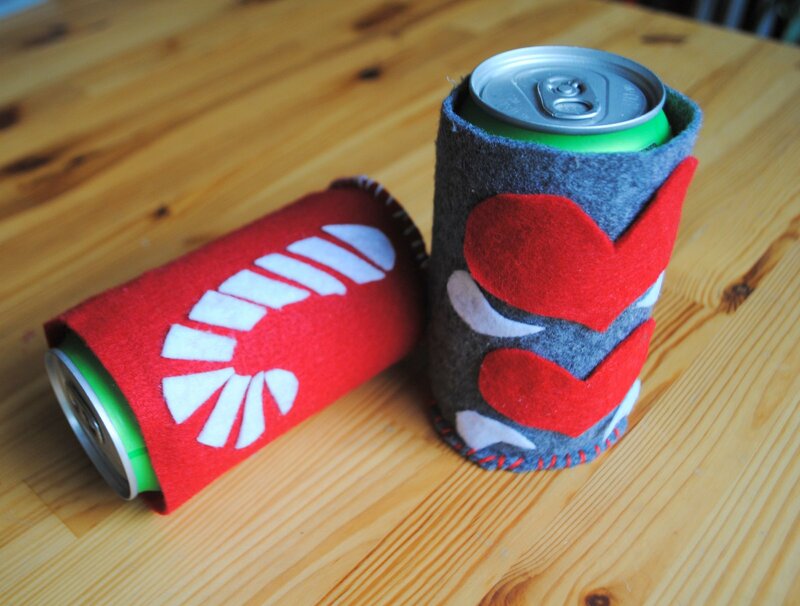 To decorate your koozie, you'll need to trace and cut out felt shape in contrasting colors. To create this cute folk art heart decoration, you'll need to cut out two hearts - one slightly smaller than the other - and four teardrop shapes. Cheers! Enjoy your new creations.